Yes the coup is old news... so old, in fact, that most people have never heard of it (making it actually new again). But the new news here is grandpa Bush's role in the coup (unless this latest horror is old news as well that I somehow missed while watching the current fiasco unfold). And since grandson Bush is the current President of the United States and has implemented what can reasonably be called a fascist agenda of state and corporate interests united... then such news would be even more important for the American public. One would think...No? "The coup was aimed at toppling President Franklin D Roosevelt with the help of half-a-million war veterans. The plotters, who were alleged to involve some of the most famous families in America, (owners of Heinz, Bird's Eye, Goodtea, Maxwell House & George Bush’s Grandfather, Prescott) believed that their country should adopt the policies of Hitler and Mussolini to beat the great depression." You can listen to the radio report on the FDR coup HERE. 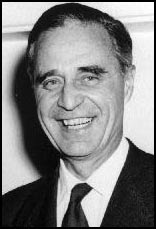 George Bush's grandfather, the late US senator Prescott Bush, was a director and shareholder of companies that profited from their involvement with the financial backers of Nazi Germany. The Guardian has obtained confirmation from newly discovered files in the US National Archives that a firm of which Prescott Bush was a director was involved with the financial architects of Nazism. His business dealings, which continued until his company's assets were seized in 1942 under the Trading with the Enemy Act, has led more than 60 years later to a civil action for damages being brought in Germany against the Bush family by two former slave labourers at Auschwitz and to a hum of pre-election controversy. But now we find out that Prescott Bush was involved in the FDR coup as well? At least we now know that fascism appears to be genetic. Update: Apparently BBC did a video documentary on this as well and Prescott Bush was identified then as well. Well, I still think it should be daily news. There's a lot more on the president's grandfather here, and here too. Pop Quiz For Terror Suspects -- Oops! You Fail!! Gandhi: Why Are We Over There Again? Who Would Attack A Children's Hospital? Can A Dictator Be Impeached? An Interview With Tom Toles ... Or Maybe Two! Not Quite A Message In A Bottle, Is It? Where Are All The Moderate Christians? Tom Toles: It's Five To Four! VIDEO: Mike Gravel Meets 9/11 Truth Head-On! Does Iran Threaten The U.S.A.? Tom Toles: You Were Expecting Einstein?